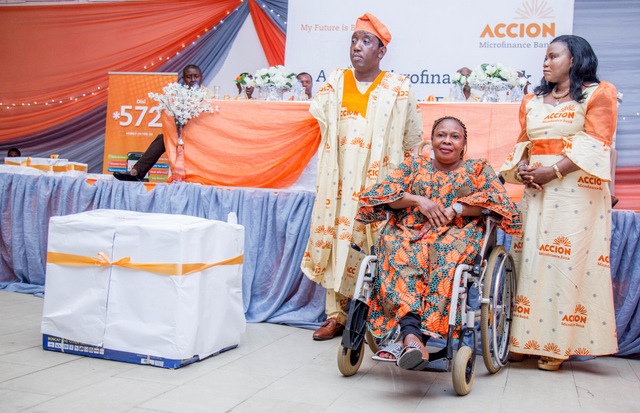 In line with its commitment to corporate social responsibility, Accion Microfinance Bank donated two 6.5 KVA generators and a cash of N129,000 to three customers living with disabilities. 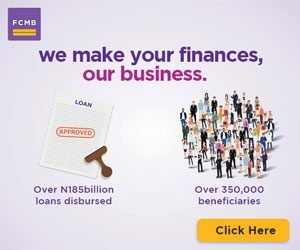 The Managing director of the bank, Mr. Taiwo Jooda made the presentation at the 2019 customer forum held at Darlington Hall, Ilupeju, Lagos. At Accion, we are concerned about the well-being of our customers. The recipients are Mr Udeze Dennis, Mr Oyeniran Amole and Madam Toyin Faniyi. 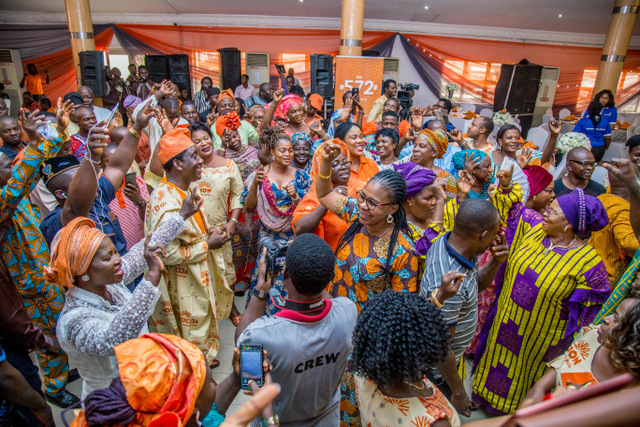 Read their amazing story to have Accion Microfinance has helped them turn around their business ventures and person life. 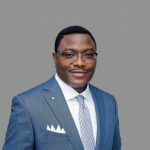 Mr. Udeze Dennis started his journey with Accion MfB in Dec. 2016. He manufacturers liquid soap from his house. His first loan was N50, 000 which he invested into his soap making business. Mr. Dennis has been diligent and consistent with his payment and Accion encourages him by increasing his loan amount; he is currently on his 4th loan cycle. Mr. Dennis started the business small and was only selling in small bottles. Now he sells in 25liters and has customers calling for pickup or delivery. Mr. Dennis never lost his tenacity and passion despite his visual challenge that began around 1994 when he started experiencing problems with his sight. The problem started with an impairment in left eye and unfortunately moved to the right eye. Prior to managing finances by himself, Mr Dennis used to rely on his brother for financial support to pay rent, medical and other household financial bills. He also spent a lot of money seeking for a cure, but in vain. Fortunately after an Accion staff talked to him about Accion’s products,, he refocused his energy and resources into empowering himself and his family . He is now self-sufficient. He conveniently pays his rent, his children’s school fees and other household bills. He can also access better health care. He says he is happy he does not have to depend solely on his younger brother for financial assistance anymore. 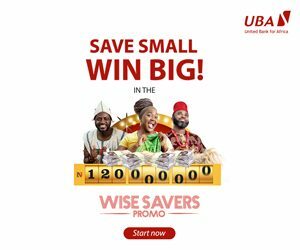 He has also improved from using plain bottles to the use of branded bottles with the name of his company DIB which sweetly are the initials of him, his wife Bisi and their first child Isaiah who is a splitting image of him. This business has grown to a family business as he runs it with his wife. 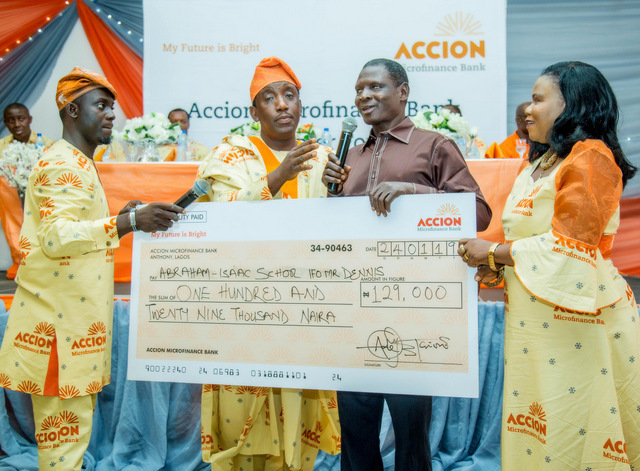 Accion MfB is further supporting him by paying for his children school fees for the outstanding of 2018/2019 session of N54, 000 and N75, 000 for 2019/2020 academic session. 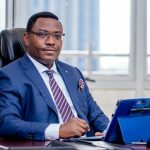 Mr. Oyeniran Amole owns a dry-cleaning outlet at Apongbon and has been a member of the Accion family since 2017. He has enjoyed the PLWD loan and he is on his 3rd cycle. Mr. Amole was born a beautiful strong baby but a poor administration of Injection led to his challenge with walking. His partnership with Accion has led to growth in his business, increased his capacity in being able to take care of his aged father and ability to pay for his children’s school fees. He recalls being deprived financial support from some financial institutions due to his physical challenge and was very pleased to find out Accion has a special product for PLWD with convenient repayment options and lower interest rate. Madam Toyin Faniyi is fondly called is a committed entrepreneur with a passion for providing solutions to her customer needs. She started her empowerment journey with Accion in 2018 and is currently on her 3rd loan cycle. Mrs. Faniyi was a seasoned teacher and entrepreneur before she was involved in an accident in 2009 which affected both legs. This incidence did not dampen her spirit, rather spurred her to start growing her business. Mrs. Faniyi is a committed entrepreneur who is committed to providing value to her customers. She aspires to expand her shop, and buy more appliances to help he serve her customers better. Mrs. Faniyi is a vibrant, hardworking and cheerful client who is readily available to serve her customers as witnessed by the Accion team that visited. Accion is further empowering her with a 6.9kva Thermocool generator to power her cooling appliances. Mrs. Faniyi shares the positive impact of accessing the PLWD loan. It has helped her business grow, re-ignited her entrepreneurial spirit and is able to afford better healthcare.